Basseterre, St. Kitts-The Royal St. Christopher and Nevis Police Force seeks the assistance of the general public in locating a missing student of the Basseterre High School. 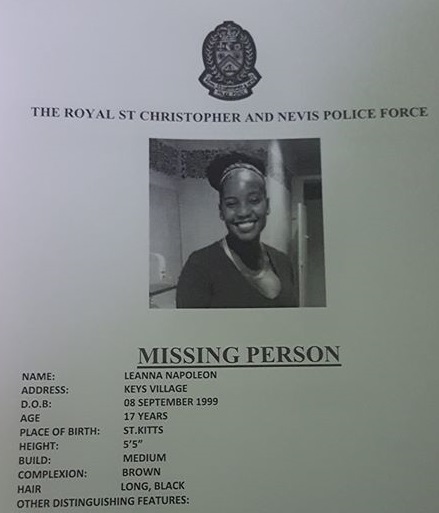 Leanna Napoleon 17 years old of Keys village was reported missing after completing some CSEC examinations just yesterday. According to a Police report the teen was last seen on Monday at approximately 4:00pm in the vicinity of Fort Street. Napoleon is of medium build, with brown complexion and long Black hair. Police are urging individuals who are aware of the whereabouts of Napoleon to contact the Basseterre Police Station at 465-2241, any Police Station, Crime Stoppers at 1-800-8877(TIPS) or by sending a tip using the SKN CRIME REPORTER on your smartphone.